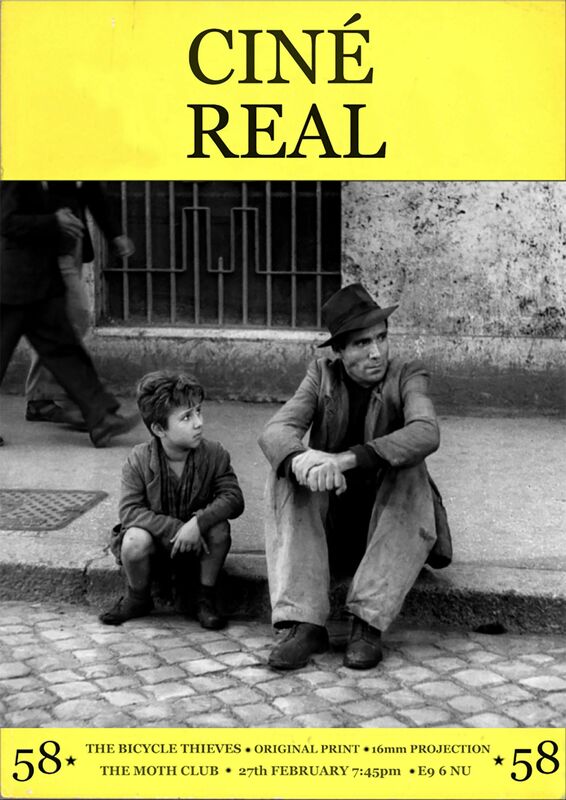 On 27 February, Ciné-Real will screen Bicycle Thieves (1948), a foundation stone of Italian neorealism and routinely voted as one of the greatest films of all time. It plays at the film club’s regular location at the Moth Club, Hackney. The film was directed by Vittorio De Sica, whose first neorealist feature Shoeshine (1946), about juvenile corruption in post-war Rome, had already impressed critics abroad. Like Shoeshine, Bicycle Thieves uses children to question the dubious adult authority around them. It follows Antonio (Lamberto Maggiorani), and his little boy Bruno (Enzo Staiola), searching for his stolen bicycle on the streets of post-war Rome. Antonio is a poor man and desperately needs to get his bicycle back as it is the only way he can keep his job – sticking up film posters. Throughout their search, Antonio makes finding the bike a priority over his son. In one scene, Bruno is overcome with dismay by their unfortunate situation. His father, angered by his son’s sign of weakness, slaps him. A harsh reaction, considering Bruno only wished to help Antonio. When father and son finally catch the thief, his neighbours come out to support him and he manages to slip away. Observing the faces in this crowd – the thief, Antonio and Bruno included – we see that everyone shares the same misfortunes in poverty. In the film's closing sequence, Antonio steals a bike himself – continuing the cycle of theft and desperation. Just as he is about to be taken to the police station, the stolen bicycle’s owner is moved by the sight of a heartbroken Bruno and asks the police to release Antonio. While Bruno has saved the day, he has witnessed his father’s humiliation as one unable to provide for his family. Before the screening, we caught up with Liam Saint-Pierre, who founded Ciné-Real in 2011, to hear about his personal connection with the film.